The Eurasian brown bear (Ursus arctos arctos) is one of the most common subspecies of the brown bear, and is found in much of Eurasia. It is also known as the European bear, common brown bear, common bear, and colloquially by many other names. "The genetic diversity of present-day brown bears (Ursus arctos) has been extensively studied over the years and appears to be geographically structured into five main clades based upon analysis of the mtDNA." Brown bears were present in Britain until no later than 1000 AD, when they had been exterminated through over-hunting. Eurasian brown bears were used in Ancient Rome for fighting in arenas. The strongest bears apparently came from Caledonia and Dalmatia. In antiquity, the Eurasian brown bear was largely carnivorous, with 80% of its diet consisting of animal matter. However, as its habitat increasingly diminished, the portion of meat in its diet decreased with it until by the late Middle Ages, meat consisted of only 40% of its dietary intake. Today, meat makes up little more than 10–15% of its diet. Whenever possible, the brown bear will consume sheep. Unlike in North America, where an average of two people a year are killed by bears, Scandinavia only has records of three fatal bear attacks within the last century. The oldest fossils are from the Choukoutien, China, and date back about 500,000 years. It is known from mtDNA studies that during the Pleistocene ice age it was too cold for the brown bear to survive in Europe except in three places: Russia, Spain, and the Balkans. Modern research has made it possible to track the origin of the subspecies. The species to which it belongs developed more than 500,000 years ago, and researchers have found that the Eurasian brown bear separated about 850,000 years ago, with one branch based in Western Europe and the other branch in Western Europe, Russia, Eastern Europe and Asia. Through research of mitochondrial DNA (mtDNA), researchers have found that the European family has divided into two clades—one in the Iberian Peninsula and the Balkans, the other in Russia. There is a population in Scandinavia that includes bears of the western and eastern lineages. By analyzing the mtDNA of the southern population, researchers have found that they have probably come from populations in the Pyrenees in Southern France and Spain and the Cantabrian Mountains (Spain). Bears from these populations spread to southern Scandinavia after the last ice age. The northern bear populations originate in the Finnish/Russian population. Probably their ancestors survived the ice age in the ice-free areas west of the Ural Mountains, and thereafter spread to Northern Europe. Brown bears could once be found across most of Eurasia, compared to its more limited range today. "Least Concern does not always mean that species are not at risk. There are declining species that are evaluated as Least Concern." The brown bear has long been extinct in Ireland and Britain, but still exists in Northern Europe and in Russia. There is a small but growing population (at least 43 bears) in the Pyrenees, on the border between Spain and France, which was once on the edge of extinction, as well as two subpopulations in the Cantabrian Mountains in Spain (amounting to around 250 individuals). There are also populations totalling around one hundred bears in the Abruzzo, South Tyrol and Trentino regions of Italy. Populations in Baltoscandia are slowly increasing. They include almost 3000 bears in Sweden, another 2000 in Finland, 700 in Estonia and around 100 in Norway. Large populations can be found in Romania (around 6000 individuals), Slovakia (around 1200), Bosnia and Herzegovina, Croatia (1200), Slovenia (500-700), Macedonia, Bulgaria, Poland, Turkey, and Georgia; smaller but still significant populations can also be found in Albania, Greece, Serbia, Kosovo and Montenegro. In 2005, there were an estimated 200 in Ukraine; these populations are part of two distinct metapopulations: the Carpathian with over 5000 individuals, and the Dinaric-Pindos (Balkans) with around 3000 individuals. The largest brown bear population in Europe is in Russia, where it has now recovered from an all-time low caused by intensive hunting. Globally, the largest population is found east of the Ural mountain range, in the large Siberian forests; brown bears are also present in smaller numbers in parts of central Asia (former Soviet states). Other clades of brown bear persist in small, isolated and for the most part highly threatened populations in Iran, Afghanistan, Pakistan, parts of northwest India and central China, and on the island of Hokkaidō in Japan. The historic distribution of bears and the impression the bear has made on people are reflected in the names of a number of localities (some notable examples include Berlin, Bern, Medvednica and Ayu-Dag), as well as personal names—for example, Xiong (熊), Bernard, Arthur, Ursula, Urs, Ursicinus, Orsolya, Björn, Nedved, Medvedev and Otso. The constellations Ursa Major and Ursa Minor are named for bears. Bears of this subspecies appear very frequently in the fairy tales and fables of Europe, in particular tales collected by Jakob and Wilhelm Grimm. 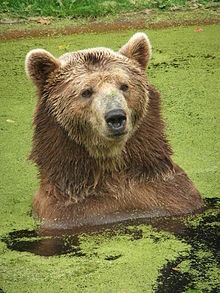 The European brown bear was once common in Germany and alpine lands like Northern Italy, Eastern France, and most of Switzerland, and thus appears in tales of various dialects of German. The bear is traditionally regarded as the symbol of Russian (military and political) might. It is also Finland's national animal; and in Croatia, a brown bear is depicted on the reverse of the Croatian 5 kuna coin, minted since 1993. ^ Bear Specialist Group (1996). "Ursus arctos". IUCN Red List of Threatened Species. Version 2006. International Union for Conservation of Nature. Retrieved 12 May 2006. ^ Calvignac, S.; Hughes, S (1998). "Ancient DNA evidence for the loss of a highly divergent brown bear clade during historical times". Molecular Ecology. 17 (8): 1962–1970. doi:10.1111/j.1365-294x.2008.03631.x. PMID 18363668. ^ Albino brown bear killed in 2009. Dnevnik.hr (2009-10-29). Retrieved on 2011-09-24. ^ Lovegrove, Roger (2008). Silent Fields: The long decline of a nation's wildlife. London: OUP Oxford. p. 416. ISBN 978-0199548156. ^ a b Pastoureau, Michel (2007). L'ours; Histoire d'un roi dechu. p. 419. ISBN 978-2-02-021542-8. ^ Sagør, J.T. (1997). "Compatibility of brown bear Ursus arctos and free-ranging sheep in Norway". Biological Conservation. 81 (1–2): 91–95. doi:10.1016/s0006-3207(96)00165-6. ^ "Brown Bear". Tooth & Claw. Archived from the original on 2007-12-23. Retrieved 2008-01-05. ^ Pasitschniak-Arts, M. (1993). "Ursus arctos". Mammalian Species. 439 (439): 1–10. doi:10.2307/3504138. JSTOR 3504138. ^ a b c d Taberlet, Pierre; Bouvet, J. (22 March 1994). "Mitochondrial DNA Polymorphism, Phylogeography, and Conservation Genetics of the Brown Bear Ursus arctos in Europe". Proceedings of the Royal Society B: Biological Sciences. 255 (1344): 195–200. doi:10.1098/rspb.1994.0028. PMID 8022838. Retrieved 13 January 2015. ^ a b Taberlet, P.; Swenson, J.E. ; Sandegren, F., F.; Bjärvall, A. (1995). "Conservation genetics of the brown bear (Ursus arctos): localization of a contact zone between two highly divergent mitochondrial DNA lineages in Scandinavia". Conservation Biology. 9 (5): 1255–1261. doi:10.1046/j.1523-1739.1995.9051255.x. ^ Taberlet, Pierre; Camarra, J.J.; Griffin, S. (1997). "Noninvasive genetic tracking of the endangered Pyrenean brown bear population". Molecular Ecology. 6 (9): 869–876. doi:10.1046/j.1365-294x.1997.00251.x. PMID 9301075. ^ Bear Online Information System for Europe. Kora.ch. Retrieved on 2011-09-24. ^ Croatian National Bank. Kuna and Lipa, Coins of Croatia Archived 2009-06-22 at the Wayback Machine: 5 Kuna Coin Archived 2011-06-04 at the Wayback Machine. Retrieved on 31 March 2009. This page was last edited on 13 April 2019, at 20:38 (UTC).